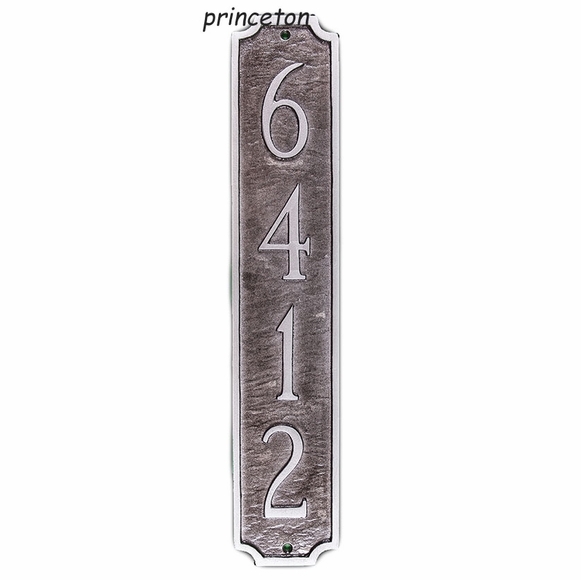 Personalized Column Address Plaque - - vertical address sign for tall narrow spaces. Holds up to five 3" characters. Choose from eight different metal plaques with heights ranging from 16.5" to 18.75" and widths from 3" to 3.75". Made in USA. Dimensions vary slightly from plaque to plaque, so you should find at least one that fits your tall narrow space. Great website, excellent delivery time and an awesome product. Nice job Comfort House! The vertical residential number plaque I ordered was as described. The appearance, finish and styling creates a permanent, visible and highly desirable residence address that is unique in my neighborhood. The product elevates the appearance of my home and how it is identified from the street. I hope that other residents will consider this product as it only enhances the appearance of the neighborhood. High quality address plaque...it appears that it will hold up well to the elements.